A teenage girl stands on dirt mixed with brambles, pieces of ragweed, and burned-out remnants of cypress roots. Nothing will ever grow where she stands. The girl faces away from the reader and away from her home. Her eyes are focused ahead, at tall buildings in what appears to be Houston, across the Mexican-US border. The blue sky on the “American” side frames her face and neck, and a breeze blows back her hair. She wears a white Mexican peasant blusa with embroidered trim, which reveals skin at her back and part of her face, offsetting her brown complexion and high cheekbones. Above her head, in large purple italics—with a barbed-wire design running across it—is the title: “Illegal.” This young person’s immigration status is all that defines her. The CIP page lists the word “illegal,” and the phrases, “illegal immigrant” and “illegal aliens,” but not “undocumented.” The epigraph states (in caps): WE ARE ALL IMMIGRANTS. This is all a set-up for younger YA readers, documented and not. People who cross without documents do not not refer to themselves as “illegal.” They use the term “indocumentado” (undocumented) or “sin papeles” (without papers). In truth, ¡Ningún ser humano es ilegal!—To be human is never illegal. 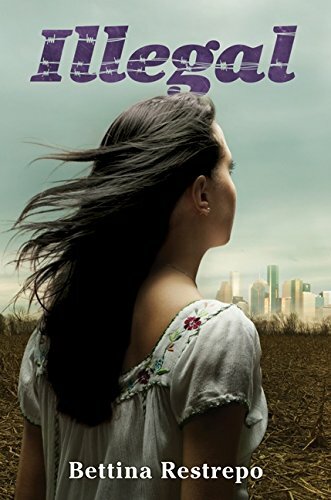 In this first-person narrative, 14-year-old Nora and her mother, searching for Nora’s father, make the harrowing journey from their small Mexican town of Cedula, to Houston, Texas. He had left three years before, seeking work to support his small impoverished family. In attempting to describe the difficulties faced by undocumented young people, Restrepo exploits the story with stereotypical shortcuts. Everything that could possibly be wrong is wrong—from faulty Spanish (including Espanglish and code-switching) to inappropriate Black English to thoughtless cultural symbolism to common tropes about Mexican people to statements of misplaced ideological positions in characters’ mouths—it’s all problematic, to say the least. Faulty character development aside, Illegal is culturally, factually and historically illogical. Both Nora’s narration and her dialogue, which are assumed to be in Spanish, are presented in English with a few Spanish words tossed in. Sometimes the italicized Spanish follows the English as a translation, and sometimes a few italicized Spanish words or phrases are tossed into an otherwise English narration. When she’s speaking to the reader—or when she’s communicating with Spanish-speaking characters—Nora’s narration and dialogue are presented in faultless grammatical English. But when she’s attempting to communicate with an English-speaker, Nora struggles for words and speaks in broken English. (2) For instance, when Nora tries to explain to her friend, Keisha, why she can’t go to school, she says, “I need to English.” This is immediately followed by Nora’s telling the reader, “If I was smarter and spoke better, it would help me.” And “I school. No money. Papers” is a culturally incoherent word salad. Had the author written the narration in the third person, the story would have been easier for the reader to understand. But because the author chose to narrate the story in the first person, there’s a jarring contrast between the grammatical English she uses to communicate with the reader and the broken English she uses in dialogues. This broken English doesn’t reflect the actual rhythms and syntax in Spanish that one would expect to find in someone who is struggling with English. Poor self-image aside for now, if Nora were narrating in English while processing in Spanish—as she certainly would be—it’s without question that her grammatical English in the narration would have contained Spanish metaphors and a comfortable Spanish rhythm. And her English in the dialogue would have followed her Spanish thought patterns. So, rather than “I need to English,” she would have said, “I need English” (“Necesito inglés”) or “I need the English” (“Necesito el inglés”). This technique would have served to connect the reader to Nora’s thoughts rather than having them try to figure out what’s going on. But rather than facilitating the communication, the author chose to craft the narration and internal discourse in a way that turns out to be super-awkward and can be confusing to the reader. Later, Nora looks inside the “money jar”—“We had enough to buy our way across the border, but then what?” Turns out, it’s a “stack of money”—a “stack of pesos.” Nora tells Grandma that “Mama went into town to buy bus tickets to the border.” We don’t know if she exchanged the pesos for dollars. The two take a bus to Matamoras, and Mama takes the address of the coyote out of her purse. “I guess we should find a taxi,” she says. The two meet the coyote, who demands “two thousand each,” and Nora bargains for “fifteen hundred (for both, it’s assumed). Nothing else.” The coyote grabs the money and mother and daughter climb inside the fruit truck that will take them across the border. There is no context for the family’s grinding poverty. (3) That they have barely enough money to survive, then they don’t, then they find enough in the “money jar” to buy their way across the border is confusing and inconsistent with reality. We don’t know if this money is in pesos or dollars. Either way, it’s far from enough. Coyotes—human smugglers—accept only US dollars and they don’t stand around and bargain because they don’t have to. Coyotes often charge thousands for the trip across the Mexican-US border; it would take $2,000-$3,000 just to get their attention. And a fourteen-year-old girl—or anyone else—would not dare to attempt to negotiate with a coyote anyway. They’re connected with the cartels. And there is no way that a coyote’s address would be written down. That a destitute farm family turns out to have enough saved in their “money jar” to pay bus fare and a coyote and support themselves until they find work, and have money to send home—strains the reader’s suspension of disbelief. Families who can’t afford to pay a coyote look for other ways of crossing the border—risking life and limb by riding atop La Bestia, the Mexican death trains; risking drowning by trying to navigate the treacherous Río Grande using old tires; or risking dehydration and death by walking hundreds of miles through the arid desert. Further, once they get across, Mexican families do not have to struggle to survive gang violence, do not have to struggle to exist in a filthy room or apartment, and do not have to struggle to find work that is, for the most part, nonexistent. That they do is a common trope. Rather, there are internal social networks in the community that outsiders do not know about. An undocumented family showing up in Houston would immediately be taken in by an underground network of people who would be on the lookout for them. There are jobs ready and a place to stay. The family would be taken care of. Several of the men who stayed in the area saw the accident. They think the company dumped him by the work hall…. The company worried the construction site would be shut down because of the illegals. All of the other men left the site because they were afraid. The owner threatened that he would turn them in to immigration. If there are any issues in Illegal, they are personal rather than political, and, in the end, all is neatly resolved. Like a long-running telenovela at the end of the series. Illegal is dripping with incongruous similes and metaphors (“Mama melted stomach first into a box of mangoes”), internal contradictions, and cultural inconsistencies and anomalies. It also contains descriptions of self-loathing (“I could just keep on being a stupid fruit picker and never think again”), problematic depictions of race, and disability tropes and fat-shaming. A few examples are below. In this time of physical, social and political attacks on immigrants, migrants, refugees and asylum seekers, this bears repeating: ¡Ningún ser humano es ilegal!—To be human is never illegal. Restrepo’s book is not recommended. Muchísimas gracias a David Bowles, María Cárdenas, Lyn Miller-Lachmann, Guadalupe García McCall, and Noam Szoke. African-American Vernacular English (AAVE) is a recognized group of dialects of standard English, with regional grammatical patterns and general rules and meanings. It’s clear that Restrepo does not know AAVE. She just doesn’t get it right. Keisha’s “Black” speech is not only inappropriate—it’s a sloppy mess. Both her dialect and rhythm change within the same thought. • The blond girl sitting high up in the chair looked like an angel. Highlights in her hair twinkled like it had a lightbulb glowing through it. • Keisha’s skin intrigued me, because I didn’t know much about black people. Most people I knew were different shades of brown. Some like tea, others like coffee with milk. Never black. I hoped to touch her hair one day. • “Are you okay?” Keisha asked me. “Do you even know what I’m saying?” She said it louder, like I was deaf. “She doesn’t speak English, dummy,” Flora said to Keisha. • “You can’t let (grapefruit) decay on the branch. Bad karma,” lectured Grandma inside our concrete house. • Hola, mami.—Hey, sweet lady. Her dedication reads: “For Manuela and Mimi—and the roots you have given me.” If Manuela and Mimi worked at Fiesta Mart, the author’s research was probably not about root vegetables. (2) What’s commonly referred to as “broken English” is the use of English words and phrases filtered through the thought processes of a fluent speaker of another language. (3) Due to US economic policies (specifically NAFTA) and the Mexican government’s complicity, the US diversion of water from the Río Bravo has led to one of the greatest droughts in history. Suffering Mexican farm families have insufficient water and many have had to abandon their farms and come to El Norte. It’s a matter of survival. I take offense at the comment "that's what a whiny white girl would do." The white Catholic girls I know would never disrespect a church. However, in moment of anger, they might do something they regret, as I'm sure a Mexican Catholic girl might do. Don't presume to speak for everyone. Thank you for your comment, Anonymous, and please don't presume that I presume to speak for everyone. Is the "whiny white girl" comment the only thing that offends you? Do the common tropes about Mexican people and other problematic descriptions of race, the stereotypical shortcuts, the faulty Spanish, the inappropriate Black English, the thoughtless cultural symbolism, the incongruous similes and metaphors, the disability tropes and self-loathing and fat-shaming, and (last but definitely not least) the descriptions of human beings as "illegal"--does any of this in the book offend you? Or haven't you read the book? Or is maintaining your privilege to tone-police more important to you than anything else?